My husband loves to golf… I do not. So when he is off playing golf on the weekend, I hit the sewing room. Strangely however, I do like to watch professional golf tournaments on television. Last weekend, I was kept company by the golfers at the Masters Tournament on the TV in my sewing room. Granted, most of the time my back is to the screen, but I can keep up with who is in the lead and who has just lost the lead by just listening. Neil always says I still treat TV like a large radio. It is true, I rarely watch anything without having my eyes on something else I am doing with my hands. Today, I made a really fun accent pillow with some bits of a new line coming out soon, Autumn Landscape, and a random scrap of fabric that had an interesting decorative weave that I had used on another throw pillow a few years ago. I’ve noticed patchwork pillows with a mix of fabrics and decorative stitching seem to be the hot item this spring in stores like Pottery Barn, West Elm and Crate and Barrel. Also, small rectangular pillows and small bed pillows are the new shapes used with 20 inch throw pillows. I admit, it is a good look. To start, I sketched out a design on graph paper and then assembled the fabrics. I decided to use a decorative stitch on my machine to embellish one of the fabrics. I used a cream thread for the decorative stitch to tie the mostly brown fabric to the large floral with the cream flowers. It seemed to lighten it up a bit. When using a decorative stitch, I test it to determine the width and the length of the stitch that I like before stitching on the piece I’m going to use. 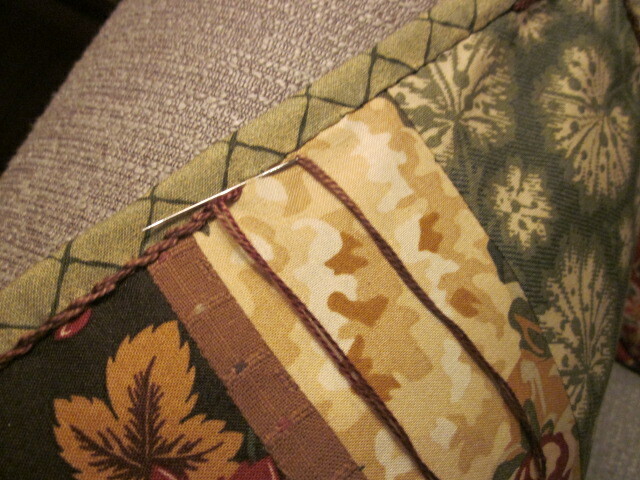 I also like to back the fabric with a foundation to give the fabric more weight which always results in a nicer stitch. I fell back on my usual product for this purpose…paper toweling. I always have it in the house and it tears away easily after stitching. I have been using it forever, and it always works. After finishing the edge with a binding (just like a quilt) I then decided to add a decorative hand stitch with a double strand of #5 pearl cotton in the ditch right next to the binding of the pillow to add an outline and accent to the patchwork center. 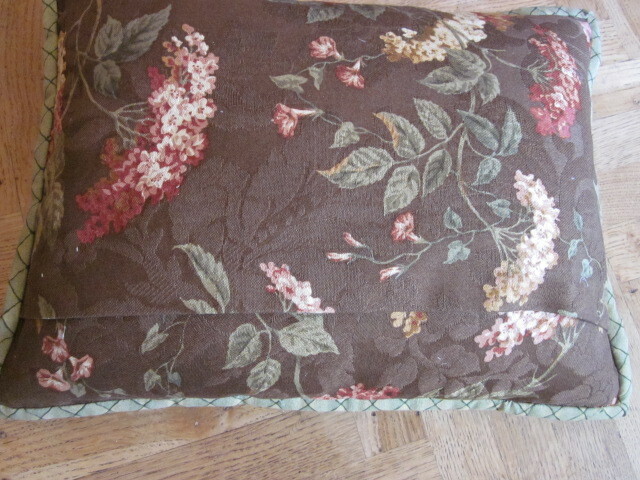 I used a simple stem stitch and stitched only through the top layer of the pillow. It’s easier that trying to go through all the layers of the pillow covering. Because of the thickness of the pearl cotton, you will have to use a hefty needle with a very large eye. Since you will be stitching through just the top layer, the big needle will still go through nicely. As with so many of my pillows, I made an envelop back to avoid putting in a zipper. Instructions for this technique can be found in many of my past Thimbleberries publications. 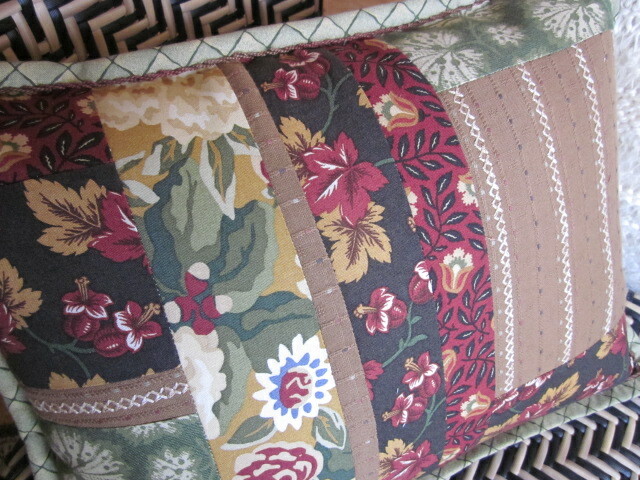 The fabric used on the back of the pillow was also a scrap of decorator fabric from years ago. I have just enough left to make one more pillow. As usual, scraps just never seem to go away, no matter how many times I attempt to get rid of them and throwing away is just not a option. Love your pillow. Is the size 12″ X 16″? I love the quilt binding on your pillow. I thought it was piping which is harder to do. I will definitely try this. Paper towel for a stabilizer, what a great idea. You learn something new every day. I was really pleased with the pearl cotton “piping” as well. I think I am going to apply this technique on my next table topper or small wall quilt. It is the kind of thing that is fun to see on a project that is seen close up …wouldn’t want to stitch around a bed size quilt where it would never be noticed. Thanks for the paper towel stabilizer hint. I was just about to buy more stabilizer! Love your fabric lines. So glad you are back. Any books in the works? There is a book in the works, but way to soon for title or date. Will definitely keep you all posted. ☺ so, the blocks of your next quilt is going to be named after golfers….Gary, Ernie, Louis, Tiger ???? hehehe Love your fabric!!! Thanks for the tips on paper toweling and decorative stitching! The pillow is beautiful. I am looking forward to your new Autumn Landscape fabrics. The fabrics should be in quilts shops by June. If you can’t find them, email me I could help you find a source. We are so much alike! I no longer golf, but love watching the beautiful courses on tv…with my eyes on something in my hands! I was sidelined during the Masters by a flare up in an autoimmune disease, so I actually watched quite a bit of it. The location is simply stunning. One way we do differ, is I like zippers in my pillows. I buy low-cost zippers from WAWAK. About a quarter of the way from one end for rectangular pillows, or across the middle for square, I split the backing fabric, stitch in from each edge about 3″ or less, depending on the size of the pillow, and install the zipper. It takes no time and the results suit me better than a bulging back, which is what I end up with using the envelope backing. Hey! Whatever works for you, which is why we create to begin with!!!! Love the pillow….and I’m LOVING my Craftsy block of the month. I’m almost ready to do the appliqué!!! I have never heard of WAWAK…interesting. When I use zippers, I always put them in the bottoms seam, but that is not often. I try to avoid a bulging back by really overlapping the fabric a lot…sometimes by 6″. When I put the opening lower, like in this project, it doesn’t gap as much. I suppose the pillow form isn’t as full towards the edge. I am happy you are enjoying the Garden Charm quilt…it is a pretty quilt.